Believers, the moment we believed and received Christ we became new creations. God’s creative power came upon us and all our old things passed away—thoughts, wants, desires, things we used to do and say, all deemed old, for we were born again, new born babes in Christ, eager to learn and grow. Do you remember that time? It was a glorious moment! Yet, as time goes by those old things that passed away somehow sometimes get resurrected by our flesh or by satan, they start trying to come back upon us, but we can fight them off with the power that is in us and the knowledge that they are no longer a part of us, for we are new creations with new thoughts and desires, covered with the blood of Christ, walking in the Spirit, and seeking to do God’s will. 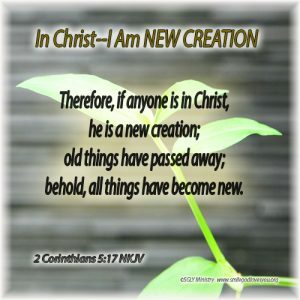 A new creation can never be what it was before, so don’t be deceived by satan or tempted by your old fleshy nature, you are new, and those old things are passed away, so live and enjoy every moment of your new life in Christ!